The Goberian is one pretty large cross breed, known mainly for traits such as intelligence, independence, alertness, loyalty and sociable. 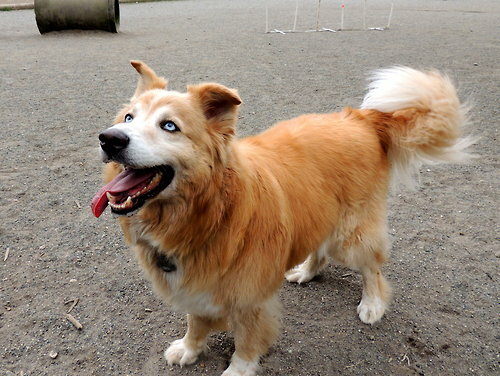 The parent breeds for this dog are the Golden Retriever and the Siberian Husky. Most often, the Goberians come in black, gray, brown, white, cream and yellow coat colors. As many other dogs, the Goberians need an appropriate level of exercising in order to be kept fit and healthy. They are very good in a a lot of activities, such as hunting, agility, sighting, guarding, sledding, search, rescue and weight pulling. The weight for a medium sized male adult can be up to 40 kilos and the height is usually between 53 and 60 centimeters, while females usually don’t go past 36 kilos and 56 centimeters tall. These dogs can reach 15 years of life. The Goberians are known for the loyalty, friendship and affection they usually manifest. They enjoy very much human companionship as well. If properly socialized, they can get along quite well with other pets or children. They have several abilities, including agility, sighting, sledding, guarding, weight pulling and rescue. Goberians are a hybrid breed and are part of the working/sporting group of dogs, due to their parents. They have an outer and an undercoat. The first is a bit longer and either straight or wavy, while the latter is denser and has a soft feeling. Usually, the coat color is black, white, red, yellow or gray. There are no known special health issues for the Goberians, but they have the risk of suffering from obesity, if they don’t receive enough physical stimulation. This is a low shedding breed so that the brushing and other maintenance need to be carried out within normal terms. The training should be done in a gentle manner, as they respond best to this method. They need to receive a consistent level of physical exercises, but with no pushing over the limits, as excess exercising can lead to joint problems. There are several organizations that are accredited to assess hybrid dogs and establish the breed’s history and pedigree and the Goberian is a recognized breed.The life expectancy for the Goberian breed is, on average, between ten and fifteen years, but this may vary depending on circumstances and life style. 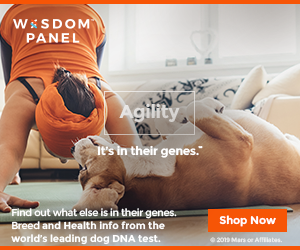 This hybrid dog is medium sized and from an appearance point of view can resemble either parents, the Golden Retriever or the Siberian Husky. Their head is round shaped and well proportioned, which gets a bit wider between the ears. 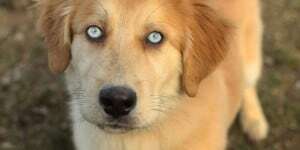 The eyes can have either color of their parents’, brown like the retriever or blue like the husky. Floppy ears and narrow, cute muzzle come to complete the head’s aspect. Overall, the Goberian is a very beautiful dog and is for sure a noticeable presence. The Goberian adult male measures between 54 and 60 centimeters, while the females are usually not taller than 56 centimeters. The males usually weigh up to 41 kilos and females can reach about 36 kilos. It turned out that the mix between the Golden Retriever and the Siberian Husky was successful and brought up a wonderful result – the Goberian. They are gentle dogs, heritage from the Retriever, but also very driven, which has been passed on by their Siberian Husky gene. They are remarkably active, but at the same time loyal, affectionate and excellent companions for humans. They manifest obedience and get along very well with children and other pets, not to mention the members of the family. They enjoy both being outside and playing or being engaged in activities and spending time with the family, hanging around family members. The yard is recommended to be secured, as they may have the impulse to roam, coming from their Husky side. Obedience and desire to please the owners are quite present at Goberians. They are also intelligent and alert, which makes them good watchdogs or guard dogs, generally being wary of strangers. Given their size and personality, they are not fit for living in smaller apartments, as they need open space for play and exercise. Similar to other dogs, although they get attached to all family members, they choose a favorite member and they will look to spend more time with him or her. With a proper training and socialization, the Goberian can do very well with children and other pets around the house. However, it is always recommended not to let a dog and a child unsupervised, in order to prevent inconveniences for either the dog or the kid. Fortunately, the Goberians are low shedding dogs, thus requiring normal grooming. It takes normal brushing and maintenance to ensure the best care for this breed. Weekly brushing sessions, preferably two or three should do the trick with removing the dead hairs and prevent mats from occurring. The ears also need regular cleaning and drying in order to prevent infections, while baths are recommended only on occasion. There are no specific health issues for Goberians or with a higher risk of occurrence, but they may become victims of obesity if they don’t properly exercise. A diet may help in preventing obesity for these dogs. Goberians are active in general and thus they need daily exercising, also helping them to keep fit and healthy. Lack of exercising can lead to unwanted behavior. Training is recommended to start at early age stages, along with socialization. One can opt for the dog kindergartens for training purposes, which may turn out to have positive effects on the dog’s later behavior. It is important to understand that a bad behavior from the owner’s part can lead to a bad behavior in the dog. In order to avoid this, the training must be firm, solid, but, at the same time, patient and gentle. Goberians are not the easiest to train hybrid dogs. Despite their intelligence that helps them during the training process, their independence may hinder it on occasions. Consistency and confidence must be used when training these dogs.